Samantha Bock, a senior biology major, spent the summer as an intern with the Environmental Protection Agency. Biology senior Samantha Bock spent the summer as an intern with the Environmental Protection Agency (EPA) thanks to a Greater Research Opportunity Fellowship. The $50,000 fellowship—one of only 34 that the EPA awarded nationwide—will also support Bock’s final year of study at Cal Poly. 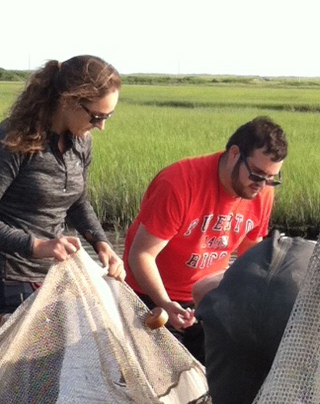 Bock studied the effects of pollutants on the mummichog, a small fish, at the Atlantic Ecology Division of the EPA in Narragansett, R.I. Working with EPA scientists, Bock conducted field and lab experiments. The study focused on how human activities affect the fish at the molecular, individual, community and ecosystem levels. The fellowship gave her experience with a range of experimental methods and introduced her to an integrative approach that she hopes to continue in the future. Bock plans to pursue a doctorate in ecology or marine science after graduation.